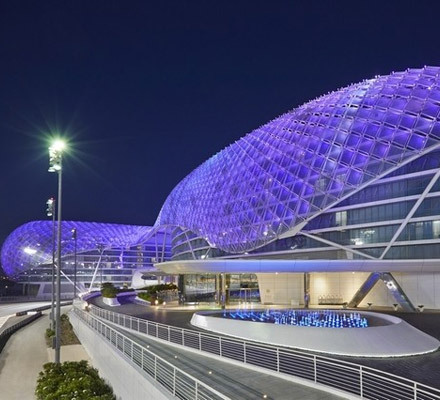 Where: The grand structure stands out on the Yas Island with its magnificent exterior that glows at night with a canopy of LED lights. Overlooking the Yas Marina Formula 1 Circuit and a yacht-filled marina, those looking for an adventure will feel at home at the Yas Viceroy Abu Dhabi. However during our visit, our main aim was to sample to scrumptious foodie delights on offer. The hotel offers an impressive selection of international restaurants, along with an array of glamorous bars and lounges. We checked into a spacious Deluxe Suite, which was both luxurious and comfortable with a social lounge area, a decadent bathroom complete with a standalone bath tub, and a vast bedroom. The hotel has plenty on offer, both indoors and out – we’d highly recommend a stroll through the picturesque Palm Gardens! Facilities & amenities: After staying at the Yas Viceroy, it quickly became clear that there is little that this hotel doesn’t offer and be sure to speak to the super-helpful concierge desk about what to do on the island (Yas Beach and Yas Waterworld are must-see’s). On offer at the hotel are its state-of-the-art spa and fitness facilities, along with both a family and child-free pool where guests can opt for splash-free relaxation before heading to pre-dinner drinks at Skylite Rooftop & Lounge. An unusual addition to this property is its art gallery, which is certainly worth browsing through. What we ate: We enjoyed nibbles at the in-house Italian restaurant, Amici, upon arrival, where we delighted in the restaurant’s Cicchetti menu – a sharing concept with small, but satisfying dishes – and sampled the homemade spinach and ricotta ravioli paired with the mouth-watering Burrata Pizzette. For dinner, we were truly spoilt by Chef Idfan Mierza, who prepared a divine assortment of dishes that we made our way through at Kazu. Serving up truly delicious Japanese fare, this restaurant allows you to tuck your chopsticks into everything from sushi and sashimi to Toban Yaki and Robatayaki and offers a wide range of meat, seafood and vegetarian dishes. For starters, we eagerly made our way through a bowl of warm edamame sprinkled with sea salt, before chef began wowing us unusual dishes such as Taco’s topped with a creamy blend of tuna (this surprisingly turned out to be one of our favourites from the selection), followed by eggplant miso Robatayaki and an beautiful platter of sushi and sashimi specialities, which disappeared quite quickly. Though we were already struggling, sizzling plates of Teppan tofu and Toban Yaki wagyu beef were hard to resist and we’d highly recommend saving space for them! Of course, our dessert stomachs managed to cram in a sweet end to the evening; pretty platters of berries, mochi ice cream and sweet sake. Best for: A scrumptious staycation for thrill-seeking foodies. If you want to go: From Dhs630 per night. Call +9712-6560000 | E-mail yas.reservations@viceroyhotelsandresorts.com.